The Voice of The Philippines Season 2 is still on the search for the most precious voice the country had to offer. Team Sarah is still on the search for the top six to go on to the Live shows and the quest continues on January 17, 2015. Sarah had been looking for an artist that is strong enough to wuthstand everything for the sake of his or her dream. The first team to go on to the Knock out rounds were decided by their coach Sarah Geronimo. Monique Lualhati sang “I Knew You Were Trouble”, Poppert Bernadas delivered “Natutulog ba ang Diyos”, while Demie Fresco sang “My Immortal”. The three had been chosen to be in a group because of their ability to give an effortless yet powerful performance. Monique chose the “I Knew You Were Trouble” to showcase her talent. Sarah reminded her to express the thought of the song. Poppert was driven by his aunt’s aspirations. Sarah wanted to help him deliver the song in his comfortable notes. She asked him to sing from his heart. Demie was described by their coach to have a raw talent and a diva in the making. Sarah said that her song choice had been very nice and that Demie should find a point of view where she will be comfortable to focus on. Sarah had been evidently focused on listening to the three artists’ performance. Bamboo evidently rooted for Poppert while Apl said Demie did the best. Lae said Monique was quite unique. Sarah said Monique had been effortless while Poppert had made her realize that stage performers had been hard workers. 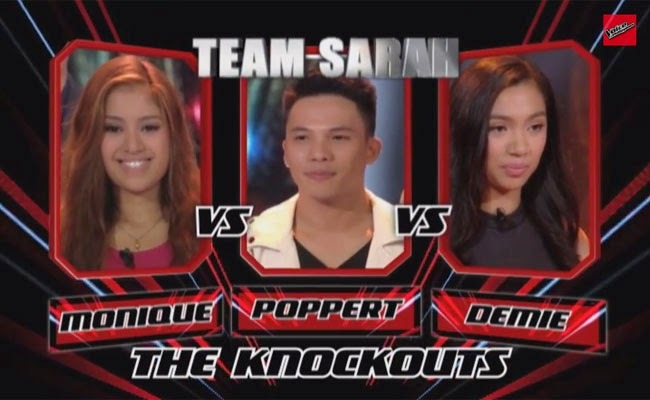 Monique Lualhati and Poppert Bernadas are the firsts to enter the top six of Team Sarah.